Back in September I wrote a post explaining that Lufthansa only releases first class award space to partner airlines 14 days before departure, and also explained how to maximize your chances of getting a flight operated by Lufthansa’s new first class. 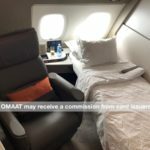 I figured I’d followed up on that by giving some advice on how to maximize your chances of booking a Lufthansa flight featuring the new first or business class product. This FlyerTalk thread is the best resource for the first class retrofits, while this FlyerTalk thread is the best resource for the business class retrofits. If you’re flying an Airbus A380 or Boeing 747-8 (which only operate out of Frankfurt) your flight will feature the new first class. If you’re flying a Boeing 747-400 (which only operate out of Frankfurt) there’s an excellent chance your flight will feature the new first class, as there’s only one 747-400 flying at the moment without the new first class (out of about 20). The 747-400 that hasn’t been reconfigured seems to fly primarily to Denver and Mumbai. So to summarize, your best bet for being guaranteed the new first class is getting on an Airbus A380 or Boeing 747-8 flight out of Frankfurt, or an Airbus A330-300 flight out of Munich. The next best bet is to book a Boeing 747-400 out of Frankfurt, as all but one aircraft are reconfigured. 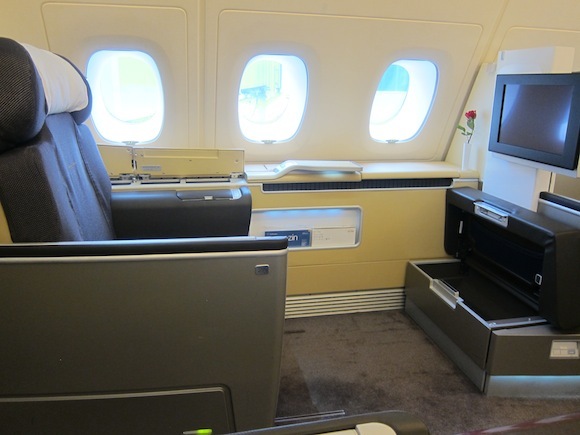 Out of Munich on an Airbus A340-300/600 you have a decent chance at the new first class. The plane types to avoid are the Airbus A330/340 aircraft out of Frankfurt and Dusseldorf, since none of them feature the new first class. As you can see, they seem to fairly consistently fly to Charlotte, Mumbai, and New York. One of the ways to tell if your flight is scheduled to be operated with the new business class is to look at the coach seatmap for your Airbus A330 flight. If there are four center seats in row 27, then it’s the old configuration. If there aren’t four center seats in row 27, it’s the new configuration. As you can see, this year we should see roughly half of the Airbus A380, Airbus A340-600, and Airbus A340-300 fleet retrofitted with the new business class. Meanwhile the Boeing 747-400 retrofit won’t begin until next year, so that’s the plane to avoid if booking future travel on Lufthansa in business class. By 2015 virtually the entire longhaul fleet should be reconfigured with the new business class. 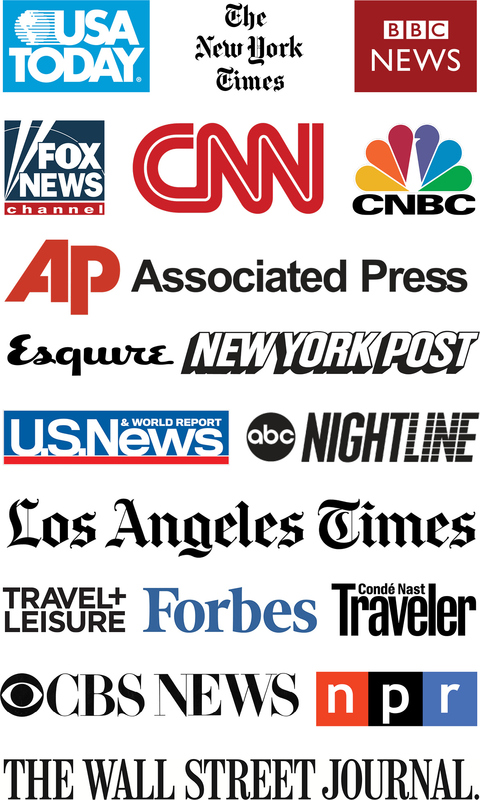 American/US Airways merger (more or less) official — happy Valentine’s Day! Does anyone know of links to a seatmap for the reconfigured 380 expected to enter service later this year? @ work2fly — I could be wrong, but I don’t believe they’ve published those yet. I have a biz seat booked on LH for July on a 747-8 (IAD-FRA). Do you know if they sometimes replace the 747-8 with 747-400 or can I be certain that I’ll fly the newer bird? @ Miguel — There’s always a chance of a schedule change as they try to optimize their schedule, though I’d say it’s extremely likely that the aircraft type sticks. Lucky, since most of us can only afford biz class due to USAIR blocking, can you tell us the difference between new biz old biz and are the plane configurations above consistent with new and old biz? I just flew both the old and new business class configurations last weekend from Mumbai to Munich (new) and Frankfurt to Atlanta (old angled flat). World of difference in seat comfort between the two. I had to change my seat in the 2nd flight because the recliner motor wouldn’t work properly. @ Michael — New business class is fully flat, while the old business class is angled flat, so it makes quite a difference. Also, there are no middle seats in the new business class. Thanks, Lucky. As always, invaluable info. Trying to book LAX-CDG via Munich or FRA in the new configuration for first week of October. Great to see the DEN-FRA flight may be among the only routes no newly configured on the 747-400. Doing that with the family in March. Thanks, Lucky. Very timely info. Really hoping for some seats to open in (new) F on the 744 FRA-ORD in July, otherwise it looks like we’ll be riding in the old Business class. Great info! I’m flying MUC-JFK C in May, thrilled to see on the seat map it will be the new business class. So if I’m flying a A330 from ATL-FRA, odds are it is the old First Class? Any word on when 747-8 will be used on the Frankfurt to Chicago route? At one time it was to come right after LAX. I will fly LH business class on USAir miles in June. Any chance I get the better business class seat? @ Trent — Unfortunately they haven’t yet announced when the 747-8 will serve Chicago. If your flight is this year and operated by a 747-400 there’s no chance of getting the new business class. In what order would you rate the new F products out of FRA? I’m thinking A380 (size, quietness, large bathroom) > retrofitted B744 (seat and bed!) > B748. But I’m not sure, and the novelty factor of the 748i is appealing. @ K.L. — I’d say I prefer the A380, then the 747-8, and then the 747-400. There’s something I really like about the 747-8. Maybe it’s the novelty factor or that it’s in the nose, but it’s a really nice ride. But quite honestly I love all three products, so I’d be thrilled with any of ’em. Great, thanks for the quick feedback. @ Mike — Unfortunately as of now no Frankfurt based A330s have the new business class. What is the likelihood of getting the new business on an A340-600 MUC-ORD in July? Any chance on a 747-400 FRA-JFK in July? @ Vinod — In which cabin? @ Alex — Neither aircraft type has been reconfigured with the new business class yet, so not a good chance with either option. I’ve just read on Flyer Talk that most of the 747-400 flights from FRA or ORD are the old First Class Cabin – is this true? Leaving FRA on May 22nd and was looking forward to a better F experience. @ Adam — That shouldn’t be the case anymore. Almost all the 747s are reconfigured, so you have a VERY good chance of getting the new first class. @ Vinod — None of those aircraft/routes have the new business class as of now. @ Adam – lucky is right that 17/21 of the 744s are new F at this time, but LH433 ORD-FRA been “unlucky” (haha) enough to run with the old F all but one day over the past two weeks. It’s also scheduled to run with the old F for the next six days according to LH.com. Incidentally, DEN-FRA seems to run about 50/50 new and old F.
Flying DEL-MUC-BOS in F which appears to be operated by A340-600 and A340-300 respectively. Any of these routes have the new F? @ AK — Yes, you have a very good chance of getting the new first class. Better chance of getting it on the A340-600 than A340-300, but high chance on both. Flying EWR-DUS May 26 in F which appears to be operated by an A340-300 any chance that it will have the new F? @ Bernie — None of the Dusseldorf based aircraft have the new first class. Thanks for the quick answer, does it still pay to use the extra 17500 points for first versus business? Hi Ben, according to Flyertalk, 17 out of 21 747-400 are retrofitted. Is that the case? I have an ORD-FRA flight in F coming up next week. ORD seemed to be getting those 4 planes for the last 2 weeks or so. @ Nab — That does seem to be accurate. Chicago is striking out, it seems. hi lucky , this is manish. i am contemplating booking on the mumbai-munich on lufthansa and return in end may from munich to mumbai. 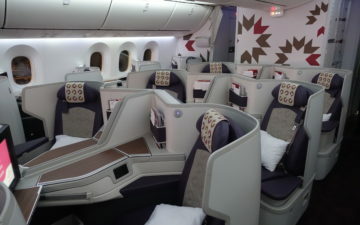 will i be lucky enough to get the new business class? if not , is there any other indian city from which lufthansa operates flights with the new business class to munich / frankfurt? please advise. @ manish — Since it’s operated by an A330 there’s a very good chance of it featuring the new business class. And based on looking at the seatmap it does look like it’s scheduled to have it too. Lucky, is the A330 to Frankfurt the new business class? From either Boston or IAD? Thanks. @ Mike B — Nope, none of the Frankfurt based A330s have the new business class. Any update on A343 FRA-based business class reconfiguration status? @ Alan — None of the A340s based in Frankfurt have the new business class yet. Thank you very much, Lucky. I am flying from BOS to MUC in First Class on a 340-300 – what is the likelihood it will have the new FC? @ Dottie — You have a good chance, though it’s not guaranteed. Checking in to see if you have any updates on the A340 from LAX – MUC for business class? We’re flying it in October. Do you think it’ll be the new configuration? Is there a place I can check on the retrofitting schedule? Thanks. @ Steve — Unfortunately none of the A340s have the new business class, so I doubt you’ll hve it even by October. Just booked an award for an EWR-MUC on a A340-600. What are my odds of getting the new Business product? Thanks for the quality info! Forgot to say. I am flying in late August. @ JLEF — Not a good shot, as none of the A346s have new business class yet. @ beachbumm — No chance of new first class. 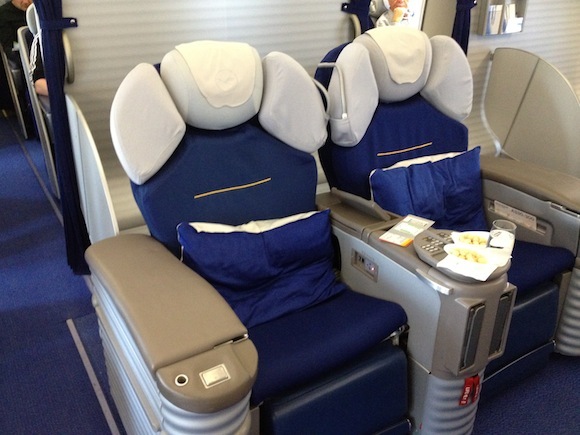 I am flying from Miami to Frankfurt in November on the A380…any chance of new business class seats? Also on to New Delhi on the 747-8…new business class? @ Steven Jay Thor — They 747-8 will have the new business class while the A380 won’t. @ John — Lufthansa is rarely releasing space at the two week mark anymore, you’re often having to wait till within a week of departure lately. I’m flying IAD-FRA on LH419 & 416. Outbound says it’s on 747-8i but return on A330-300? I’m assuming from what I’ve read above the A330 won’t have the new business seats….? I thought that route was almost guaranteed of the new seats? @ Bennoch — The 747-8 will have the new business class, while the A330 definitely won’t. Have booked 747-400 FRA-JFK in August. do you think this plane has new business class? We are in seats 10 a and 10c. @ Cyndi — Nope, the 747-400s don’t have the new business class. will a flight on an A340-600 Munich to Hong Kong be likely to have the new seats? @ Henry — Chances of new first class are quite good, more than 50%. I’m flying LH F on FRA-IAD and back (LH16 and 417) next week and according to Lufthansa’s website it is the new configuration…. Are they mistaken, i.e. can’t you trust their website http://www.lufthansa.com/de/en/First-Class-Product ? I can now with certainty say that LH is operating NEW First Class A330-300 out of FRA (to IAD). I have been on one this week, and the tip you mentioned for identifying whether or not it would be a new First Class Cabin was invalid. However, Lufthansas own enquiry service is working flawlessly, so I would recommend using that service if you want to make sure you have chosen a cabin with the new F cabin. @ Jonas — Thanks for the report, that’s great news! Actual review should be coming in the next two weeks. Despite what you posted last February, I just followed your FT link, and it seems 4 of the 747-400s out of FRA are not yet updated, rather than just one. Thank you for the valuable information, I’m planning to fly from Munich to Boston on the 20th of august, will I get the new seats or should I fly on Swiss ? Given the option I’d definitely choose Swiss. Hello, I am traveling to Frankfurt in February 2014 thru Dallas, any thoughts if it will have the new F or Biz? @ Sugar — Unfortunately it’s unlikely that the flight will have either the new first or business class. Hi my flight goes from boston to frankfurt and im going on a 747. Do u think my flight would feature the new first class? According to your post above, there is only one 744 that is not retrofitted. But according to the flyertalk thread, there are five 744s that have not been retrofitted. I’m a little confused. Are there as many as FIVE 744s that have not been retrofitted?! Does seat guru give any validity here? So on the FRA-IAD route the Lufthansa tool says the A330 is the old product. But the seat guru map sure looks like the new. And with the reports above of a new product on this route.. I am hopeful. Who to trust? @ Charles — Have you checked out Lufthansa’s toolbar which tells you whether you have the new product or not? That’s going to give you the most accurate answer. Yup.. the tool says old… and says old for every date that the A330 flies.. yet one of your poster’s above (Jonas July 11th) said he flew it on the IAD route. It only shows the 747-8i having the new product.. so somewhere there is a discrepancy. You should be hopeful Charles. LH 416 and 417 sometimes flies with a retrofitted A330 FRA-IAD. I have personally been on two such flights in July. @ Charles — Cross your fingers and hope it changes then! flown coach, why am I spending all this money? @suzie – try and change your flight to depart from MUC and your chances will go up dramatically. Otherwise fly through IAD with the B748. And, in all honesty, if you’ve never flown in any C, then even old LH C will be nice for you, so I wouldn’t worry too much and just enjoy the experience. @ suzie — As Stephan notes, if this is your first time in business you’ll probably still enjoy your flight. But if you can fly the 747-8 or an A330 out of Munich you’d have a much better chance of getting the new product. The LAX-MUC a340 that departs at 9:05p… New biz or old biz? Disregard, saw your June 25th post on how to check. No new b-class for me. Damnit. Hi Lucky …Thanks for great information..I will be travelling IAD -FRA in F class do you think A33-300 has new F class? Hi Lucky, I am flying GIG-FRAN on May/14. What are my chances of flying on new B.class? @ petronio — The flight seems to be operated by an A340-300, so as of now chances aren’t good. @ petronio — Unfortunately not a good chance at the new business class. Sorry. Hi Lucky, I’m flying DTW-FRA on 7 Nov any chance that is on the new first class? Hi lucky.. First super site!! I have a dilema, on a day flight Would you opt for lufthansa 747 400 old business or united 777 200 business first?. US Companies have a poor service as i experienced in us Airways BRU-PHL also even If flat bed the configuration looks packed (2-4-2 in a row)… You thought? @ Nekel — I’d opt out for United business class since it’s fully flat. Not a great product, but definitely better than Lufthansa’s angled product, in my opinion. We are booked on a 340-600 flight from CLT to MUC on 5/18. The LH website shows 4 configurations of the 340-600…2 with 60 business class seats, 1 with 56 business class seats, and 1 with 48 business class seats. From the diagrams, it looks like only the 56 business class seat configuration is the new business class layout. Am I reading these layouts correctly? The seat selection for my flight on LH shows 60 business class seats. Should I expect my flight to be the old business class seating? @ Jim — That’s correct, I’d expect it would be the old product as of now based on that configuration. Keep in mind it’s subject to change, though. Thanks. So if I select seats and the flight configuration changes, will I be contacted to select new seats or will I only find out during check-in on the day of the flight? @ Jim — You wouldn’t be contacted, so I’d suggest checking back periodically to review your seats on Lufthansa’s website. Could someone help me figure out if my flight from MUNICH to SAO PAULO (gru) on January first will have the new bussines class seat? I am considering buying Business class tickets PDX-VRN or YVR-FRA for Sept 2014 departure. Air Canada has the best price but the YVR-FRA flight is operated by Lufthansa. Would you go with Delta for PDX-VRN or Lufthansa Business class? The reason I am “springing” for Business is my husband has a difficult time sleeping and I am hoping a “flat” bed may help the long haul. Opinions? @ Alex Z — It’s highly unlikely, unfortunately. @ Julie — It all depends on the routing you book on Delta. If you can book a routing with flat beds the whole on them then I’d book them. There’s no guarantee that Lufthansa will have the new business class product on the Vancouver to Frankfurt route by next September. I’m flying on a330 on 12/20 and wonder if the plane will have the new business class. JFK to muc. I should add to above. @ Enwei — No, it doesn’t look like either flight is scheduled to have the new business class. LH440 FRA-IAH July 30,2014. According to the FT chart, 380s are supposed to be completed by y/e 2014. Is there any way I can see the odds of having new biz on this flight? I found the FC info website but there doesn’t seem to be one for biz class. @ austex — No way to know at this point unfortunately, since they haven’t even started the process of reconfiguring their A380s. Sorry! Concerning the C-class retrofit you advised which is expected over the coming years for A346 + A343 are these for aircraft based in both MUC + FRA..? I’m mainly interested in flying Biz out of MUC. Thanks. @ alkaff — Eventually both the Frankfurt and Munich based A340s should have the new business class, though it’ll probably be quite a while. In your experience, which west coast US city opens the most LH F space? More particularly interested in the 747 with the seat+bed. SFO or DEN? Thanks! Do you know what routes LH will prioritize with there new A380? I have booked FRA-NYC this summer, any chance there? Ben, could you give a quick update on the business class for LH as we are running against the clock with our mileage minuses? @ Gabe — Lufthansa hasn’t announced anything one way or another yet, so no way to know. Sorry! Aside from those two planes there’s not a very good chance of getting the new product as of now, and we don’t have an exact timeline on when other planes will be reconfigured. Do you have any idea if a flight in the A340-600 from Lufthansa will have the new first class? I’m traveling in the summer of this year. Award flight thats why it was impossible to fligh from FRA.. Thx ! @ Nico — If it’s a Munich based A340-600 it’s very likely to have the new first class, while if it’s Frankfurt based it’s unlikely. Considering Frankfurt -Boston on Lufthansa business 747-400 in October …any idea if the new lie flat seats will be available then? Thanks! @ Margo — I wouldn’t count on it, sadly. To the best of my knowledge they haven’t even started the retrofit on the 744. Denver to Frankfurt Lufthansa 747-400 mid Apr Business old/new seating? @ Doug — No 747-400s feature the new business class yet, so it’s very unlikely. I’m flying from JFK-FRA on July 22, 2014, is there anyway to determine if this will be the new business class now that LH has disabled the tool? @ Sam — It looks like one flight that day is operated by the A380, and the other by a 747-400. As of now neither of those planes have the new business class yet, so I’d guess your flight won’t have it. There’s a chance they begin the reconfiguration process by July, so you may luck out, but I wouldn’t count on it. I booked an award with business seats on FRA-SEA (LH490) and IAD-MUC (LH415). From what I have gathered, the first flight has the old product and the second one has the new? I am connecting in and out of both FRA and MUN; if I had the chance to upgrade to first, for which leg would you suggest I do that, taking into account the hard product, lounge options, perhaps car service etc? Update to the previous post: my FRA layover is barely longer than 1.5hrs, while my MUC layover is a bit over 7hrs! @ Stratos — If your layover in Munich is seven hours long then I’d go with that direction for the upgrade. It’s likely you’ll have the new first and business class Washington to Munich, while on Frankfurt to Seattle there’s a small chance you’ll have the new business class. So I’d definitely upgrade the direction with the much longer layover if you can. Thanks, you are a rock star! Quick follow-up, which I negleted to think of before: the award ticket is with United miles at the saver level, booked pre-devaluation. The first class space (if it opens) will open post-devaluation. So, if I could upgrade, would I need to use the additional 17.5k miles (sort of grandfathered in the old rates) or would it fall under the new chart requiring… I dont even know how many miles I would need! 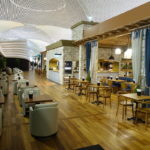 @ Stratos — Unfortunately you’d be charged based on the new rates. Any reco for what seat to get in C on the A330 into MUC? @ Anand R — Since they’re in a 2-2-2 configuration and forward facing I think it all depends on whether you prefer a window or aisle seat. If you prefer window seats any window in the middle of the cabin is good, while if you prefer an aisle I’d do a center aisle. Please advice which business class seats on DEL-MUC and MUC-JFK would be good with a baby in lap. Appreciate your inputs and thank you. @ Kumar — What aircraft type are the flights operated by and when are you flying? @ Libero — There is indeed a small chance your flight will feature the new business class, as there’s one A330 based in Frankfurt with the new business class. So I wouldn’t count on it, but it’s not out of the question either. We are travelling first week of April, on a A340 and a A333. @ Kumar — The A330 is likely to have the new business class, while the A340 is less likely to. HI, LH is reportedly at early stages of thinking about operating A380s into India. Would you have an update on where they are on the retrofit of these aircraft with the new Business class cabin (flat beds as on the 747 8i). What percent of a380 fleet had been switched over at end 2013, and what are plans as for end 2014? @ S — No A380s have been reconfigured yet, and we don’t have a timeline on the plan just yet. Thanks for the quick response. Bummer. According to this article the A380 conversion is underway. It seems a new delivery with the new business class will enter service February 28, and then the first one will be retrofitted March 31. @ Margo — It’s tough to say what will happen 10 months out. As of now not many Frankfurt based A340s have the new business class, but by then they might. Any idea if Lufthansa 747-400 will have old or new Business seats on Denver-Frankfurt run by August of 2014. Thanks for your research and knowledge! @ Mike — No 747-400s have been configured with the new business class yet, so it’s very likely to be the old product. we are business class on Lufthansa A340-600 from Munich to EWR. Any chances that we might get the new product? @ sam — As of now only two of the fourteen Munich based A340-600s have the new business class, so your chances aren’t good, unfortunately. Wondering what the odds might be for a MUC-CLT A340-600 Business reconfiguration for mid-may travel. @ Frank — Your chance on the A346 isn’t good, unfortunately. Only one of them has been reconfigured with the new business class product to the best of my knowledge. Thanks, but I’m confused because in post 166, you mentioned two Munich based planes were converted. @ Frank — Whoops, sorry, meant two. Didn’t have my coffee yet! Chances still aren’t good. @ Jon — You’re on the 747? It could still change closer to departure, but DEN is one of the cities that semi-frequently gets the old product unfortunately. Can anyone tell me if the 340-300 from eWR to DUS has the new business class seats? Lie-flat. or is it the luck of the draw? @ Kay — Unfortunately none of the DUS-based aircraft have the new first or business class. Do you think GIG-Fra will have new biz class seats in Ja/15th? @ Petronio — That’s anyone’s guess 10 months out. Lufthansa hasn’t started reconfiguring their 747-400s so it’s not especially likely, but you never know. Quick follow up (post-travel) on post 140: the 02/22 FRA-SEA trip had the new business class, while the 03/09 IAD-MUC trip had the old business class!!! Pleasant surprise on the inbound, disappointment on the outbound. @ Stratos — Wow, what aircraft operated the IAD-MUC flight? @ Stratos — Wow, that I can’t explain. All six MUC based A330s feature the new business class as far as I know. Are you sure it wasn’t the A340-300? It’s exactly the same cabin except has four engines, and some of the MUC based A340s don’t have the new product, which might explain it. Well, I don’t know, I didn’t really look at the engines! 🙂 But I even called LH the other day to confirm the aircraft which I flew and they told me it was the A330. Thanks for running a great blog. What are my chances to get the new business class on an A340-300 from Seattle to Frankfurt or a 747-400 Frankfurt to Vancouver. @ Andy — Not good at all as of now. None of the 747-400s have the new business class yet, while very few of the Frankfurt based A340-300s do either. Bummer–thanks for the lightning quick response. Do you know if the seats at least go flat? @ Andy — They’re angled flat, and I don’t find them to be all that comfortable, unfortunately. Do you know the registration of the 1 747-400 with the old first class configuration? I finally have enough points for a Star Alliance award flight in First from Europe to North America and I was thinking of flying to Denver, but I see that you mention that city as one of the cities served with old F? @ Cecilie — Sorry, unfortunately I don’t. But you can always use the first class tracking tool to see if your flight is scheduled to have it within the next several weeks. Lucky–do you know what time LH releases first class space? Does it usually enter United systems midnight German time? ET? Pacific? Any ideas? Thanks. @ Gaurav — Sorry, unfortunately haven’t noticed a particular time of day. Thanks. Do you know if space is released two weeks out pretty consistently (if available)? I’d like to upgrade a business BOS-FRA-BOM reservation in July to first since the 747-4s likely will have the old business class. Any strategies to handle this if first is released on one segment and not the other at the same time? @ Gaurav — If the cabin is wide open then they do frequently release space within two weeks. Sometimes it’s right, sometimes only a few days out. If you value the “upgrade” a lot then I’d probably change either segment if it opened up, and then pay the change fee if the second segment opened up as well. Otherwise the only option is to wait till both segments open up, which is a bit of a risk since space might disappear on one flight while waiting for the other. we are flying DTW-FRA in September so that looks like the old Business seats. Can you explain what the experience is like for ‘angle-flat’ seats? By pictures that I have seen, it looks like I could slide right off! Also, they have put us in the middle seats — any drawback to this? Thanks. @ JAL — Indeed, to some degree it feels like you’re sliding. The center seats aren’t bad at all, since both passengers have direct aisle access. One last question Lucky–I’ve been tracking space a couple of weeks out and realized that I have another problem because the BOS-FRA leg of my flight would be released a day before the FRA-BOM leg since the first leg is a red-eye and leaves a day before the second leg. 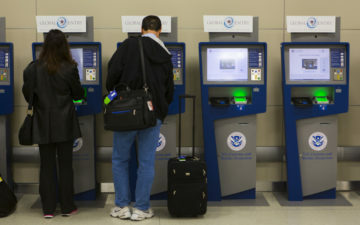 If I am fortunate enough to get two seats on the first leg and put them on hold, can call center agents pull them into an existing itinerary the next day along with the second leg? Thanks for your help with this. @ Gaurav — There’s no way to hold space in an existing reservation. You could pay to make the changes and then make them again for the second segment when space opens up, but there’s no way to otherwise “hold” the space. Thanks Lucky. I understand there is no way to add a hold to an existing award reservation. My half-formed idea was to create a new reservation for the BOS-FRA leg and hold it until the following day when the FRA–BOM leg was released, then call United and ask them to if they could merge the held seats into my existing reservation and remove the business seats. Too far fetched? Trying to spend just $200 instead of $400 for two changes. @ Gaurav — That wouldn’t work, as there’s no way for United to merge the two reservations. Does anybody know if seats 3D and 3G i First class on Lufthansa B747-8 are more narrow than the rest of the first class seats in the cabin? @ Staffan — The seats themselves aren’t narrower, but it may feel less spacious due to proximity to other seats. Does the EWR-FRA 747 feature the new first class? according to lufthansa checking tool it doesnt but according to a lufthansa agent it does… whom should i trust? @ steve m — It’s very likely to feature the new product. @ steven m — Whatever the first class tracker tool says is the most accurate information out there. Lucky–which of these planes would you say is your favorite first class? The 744 looks nicest because of the space, separate bed and having the top deck to yourself but wondering what your thoughts are since you’ve likely flown all the configurations. Thanks. Lucky–Thank you, that is very helpful! I’m flying BOS-FRA but might try to re-route to get a longer flight in something other than a 744. Hi I am flying from Bombay to Frankfurt how well is the first class ? Is it well equipped with in-flight entertainment?? Lucky–I just wanted to follow up on the advice you gave earlier. I am trying to convert my business class ticket to first along BOS-FRA-BOM. As you had recommended, I tried to upgrade legs as they became available. Today when one seat opened on FRA-BOM, I called to see if they could shift the ticket. The agent spent a long time trying to do it but was not able to do it saying the system kept giving him an error. He escalated it to his support team. The final verdict was that he could not upgrade that leg because there was no availability on BOS-FRA. According to him I could only upgrade once seats were available on all sectors. This doesn’t seem right to me based on your recommedation but I wanted to double check to see if your advice still held true and I should keep calling back (not the most appealing option since I spent an hour and fifteen minutes the last time). Thanks for any input! @ Gaurav — Definitely doesn’t sound right. That’s a case where I would hang up and call again. @ Lucky–Having a very hard time with this. Managed to get one seat switched but have a nightmare with the second. Sent you an email with details at your award booking hotmail address. Please let me know if I can hire you to help with this. Thanks. Any tips for best seats in the new F? I’ll be on the A330! @ nb — I like 2A and 2K, though all the seats are just about equally good. Any idea if the 744s have started being retrofitted yet with the new J class cabin? And if so, do you know how I could tell by looking at the seat map? @ Pietro Montanarella — Nope, none of the 747-400s have been reconfigured yet. I’m flying with my parents from Detroit to Frankfurt on the A340-600 in business class, and returning Munich to Detroit – any idea if this flight features the new business class? And are the seats flat or reclining? Great article – thanks for the detail! @ Michelle — None of the A340-600 aircraft feature the new business class yet, as far as I know. Sorry! Hi Lucky – I was wondering if you had an update to this post. I’ve got MAA-FRA coming up later this month. And while I’m guessing I’m not going to be *that* lucky, I thought a shot in the dark might be useful! Thanks. @ Ani S — What aircraft is the flight operated by for the date you’re traveling? 13th September on an a340-300. As with almost every travel plan of mine, dates are tentative but this is where it stands today! Thanks again. @ ani s — Unfortunately probably pretty unlikely, though you never know! Right. Thanks. I’m not expecting the new one, but thanks for the sugar-pill in your response…nothing wrong in hoping for it! Thanks again! 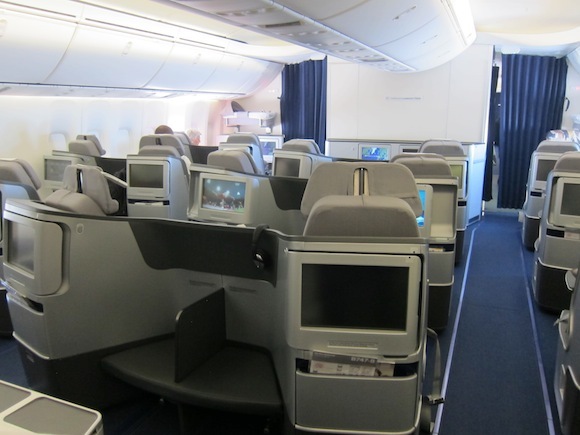 To close the comment-thread, the MAA-FRA on A340-300 did indeed have the new business class. It was initially a pleasant surprise, but turned out to be a relatively poor offering, particularly with the seat width and choice of meals. I’ll try and post a trip report in the next few days on my blog, if you think that helps. @ Ani S — Happy you got the new product at least, though sorry it was disappointing! Booked c class LH DEN-FRA for late march 2015. Any ideas how will the c class retrofit will move ‘move’ for this route? Hope to snag the new J product on 346 from BOG – FRA and 380 from FRA-SIN. Looks way better than existing blue color seats which many accuse LH of offering the worst premium product. I will reserve comments until I actually experience it in April. Is the first class product on all of Lufthansa’s 747-400 fleet (flying to FRA) a reclining upright seat on the aisle side and a permanently flat bed on the window side? @ Ernest — There are a few 747s that still have the old product, but for the most part that’s the available product. @ Vballer73 — That flight is not forecasted to have the new business class, unfortunately. @ John — Yes, all Lufthansa flights now feature the updated first class. Will my flight 453 from Lax to Munich on October 18 have the new business class seats? And…will my flight from Munich to Lax on November 6 have the new bus class seats ? Flying the a330 in business from YVR to MUC … Any recommendations on seats? I have 3H,K available and 12h.K available. 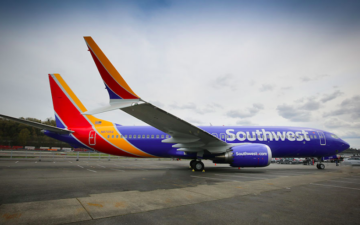 Looks awesome–definitely not usa airlines!